15th of May marks the international Food Revolution Day. Originated by British tv chef and food activist Jamie Oliver, this global theme day highlights the food education carried out in schools: having a meal together, healthy alternatives, cooperation within and outside the schools, pupil participation and experiences. The international aim is to get food education to be a part of the basic teaching of every school. In honour of the Food Revolution Day, the Finnish School Meal Network sends a video greeting to Jamie Oliver: We have Food Revolution Day every day! 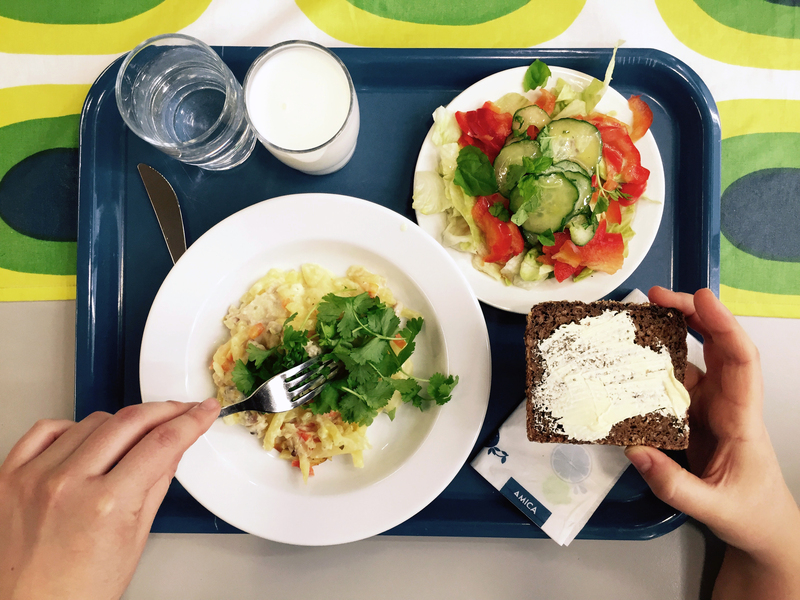 School food that is free of charge – an everyday occurrence in Finland – is a revolutionaly aspect from an international perspective. Free, diverse school meals have been a part of Finnish food culture for nearly 70 years. Many schools arrange excursions to farms and companies and trips to go blueberry picking. Food deficit theme weeks are organised, as well as the learning of proper ways to eat. Education is also carried out in a cross-disciplinary manner. In the school food delegations, pupils participate in the planning of school meals, and during their trining at a work place period they may partake in the operating of the school kitchens. Home Economics has proved to be one of the most popular of the optional school subjects. Pedagogical tools have been developed for chefs, as well as food education courses for teachers. The national school curriculum, to be published next year, will allow for even further opportunities for schools to offer food education. – We have carried out a tremendous amount of work in Finland to make school meals a part of everyday educational activity, as stated by National Board of Education Councillor Marjaana Manninen. The Finnish School Meal Network presents the world’s best know-how under the slogan “Food Revolution Day, Every Day!”. In Finland, food education is a central element of each school day. At Oulunkylä primary school, people are eating together and making video greetings in English, presenting Finnish school meals and educational know-how. Check out the video: In Finland we have Food Revolution Day every day! Oulunkylä is a fine example school, as it was awarded the School Meal Diploma on the 13th of May. The Diploma is awarded for organising nutritionally, educationally and ecologically sustainable school meals, through a multi-faceted cooperation between various operators. – The seamless team work between the school and its restaurant is very important for us. Together with the school, teachers, children and the parents we can develop even further, envisions Susanna Sipilä, Head of Restaurant Group at Fazer Food Services. – The School Meal Diploma is an indication of the skills and professionalism of the school service staff, as well as a sign of good cooperation: a successful school meal system is an achievement of the school as a whole, states Virpi Kulomaa, Project Manager of the Association of Kitchen Professionals. The Social innovation of the century: Free School meal in action. – Sometimes is difficult to see what’s right in front of you. What others see as revolutionary pioneering work is everyday life for us. This is why it’s good to stop at times and marvel at everything we’ve achieved here in Finland, states Sini Garam, Coordinator for the School Meal Network, organised by ELO, Foundation for Furthering Finnish School Culture. The network brings school food supporters, visionaries and makers to the same table, to share their knowledge and skills and to work together. – We are number one in the world not only in food education at schools but also in development as well as cooperation. Jamie Oliver is most welcome to visit us at any time, Garam smiles. The School Meal Network gathers school food makers, supporters and visionaries to the same table. The aim is to make sure that school meals, a Finnish social innovation, is seen and further developed as an essential part of our food culture. Our objective is to make the world’s best school meals even better. Apart from ELO, The Foundation for Furthering Finnish Food Culture, members include The Finnish National Board of Education, The Association of Kitchen Professionals, University of Helsinki, Child and Youth Research Institute – Cyri (University of Turku), Home Economics Teachers Union, Haaga-Perho, The Central Union of Agricultural Producers and Forest Owners (MTK), The Gastronomic Society of Finland, Finfood – Finnish Food Information, School Meal Databank Blog (Kouluruokatietopankki) and companies like Edutaru Oy, Fazer Food Services, Continental Foods Finland ja Eskimo.